Want to give yourself an instant competitive advantage? Looking for a way to increase the pool of potential leads? Consider learning a second language. There are lots of non-English speaking clients around the world who would love to own a property in the U.S. If you can’t communicate with them, you have zero chance of representing their interests. By learning a second language, you can access buyers and sellers who were previously beyond your reach. What’s more, speaking a second language makes you more valuable to a brokerage and gives you a unique marketing advantage. If you’re already working with a program like a Duolingo or Rosetta Stone, there’s another tool you might find helpful for real-world “immersion.” It’s called News in Slow. News in Slow allows you to listen to the current events of the world in the language of your choice. The program brings the speed of the language down to a manageable level, and even offers interactive transcripts to help you improve your comprehension. If you’re just starting out, News in Slow also offers a “Get up to Speed” beginners program, moving you closer to immersion when the time is right. 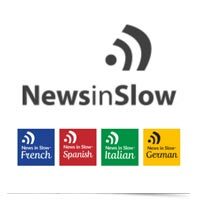 Currently News in Slow offers programs in French, Spanish, Italian, and German. Don’t lock yourself into one language. Expand your mind and build your potential business with News in Slow.